The brightly coloured poster above by Charles Sharland was issued to promote the August bank holiday of 1914. 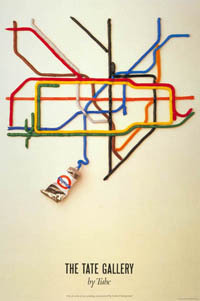 It declares 3 August as ‘Underground day’ and encourages passengers to make their choice of what to do and where to go from the many destinations available by tube and bus. However, when the day came, festivities were overshadowed by the threat of Britain becoming involved in the war on the Continent. By the end of the following day, on 4 August 1914, Britain had declared war on Germany. The poster for the 1919 bank holiday reflects on the changed circumstances. The ‘short’ war had turned into a four year conflict with millions of lives lost, and many more changed forever. For the first time there had been a home front, with Londoners at risk from aerial bombardment. The subdued design gently invites passengers to enjoy holidays once more. 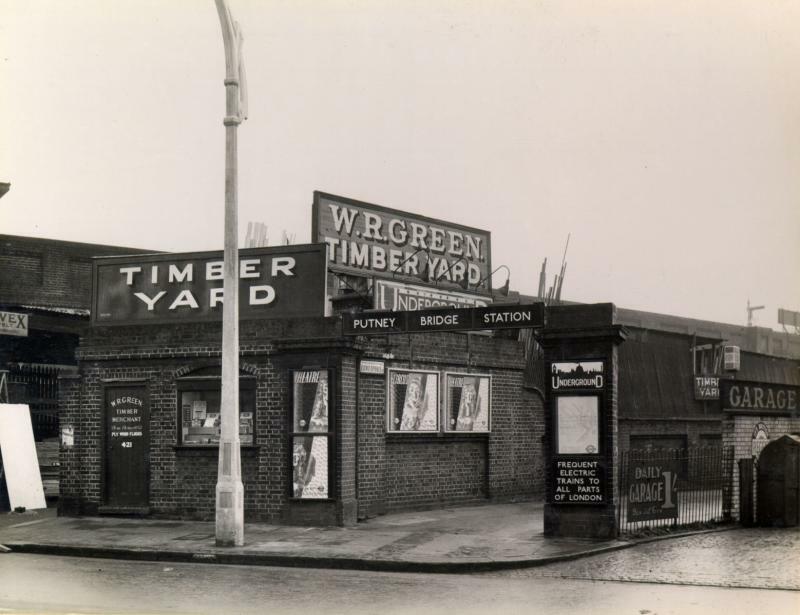 The emphasis of the trains, buses and trams being at the service of Londoners reminds us of the important role that London transport staff and vehicles played in the war. Did you know: Originally the bank holiday in August was the first Monday of the month, as dictated by the Bank Holiday Act (1871). This was until the Banking and Financial Dealings Act (1971) decreed a century later that it would fall, in England, Wales and Northern Ireland, on the last Monday of the month. Why? One suggestion was that as the latter half of August is cooler the roads would be less busy with the crowds that thronged to the seaside, getting drunk and causing all sorts of mid-Summer mischief! Have you been to a pantomime this festive season? Or perhaps you have been to see a play. 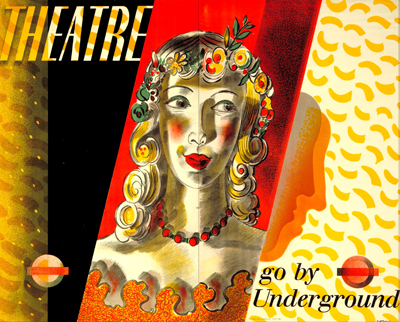 This lovely pair of posters by Barnett Freedman would have encouraged Underground passengers from the 1930s to head to the theatre for entertainment. Each poster works just as effectively on its own as it does in a pair, with the Underground roundel logo on the left poster enough to indicate that the Underground is the best way to get to the theatre. The posters were sometimes displayed together, and sometimes separately, as the two photos below show. Up close, the posters show Freedman’s mastery as an auto-lithographer. Auto-lithography is when an artist draws directly onto the lithographic plates or stones themselves, rather than let the litho-craftsmen at the printers adapt their original artwork. This poster shows Freedman’s innovative use of this technique to create unique textures in the poster. 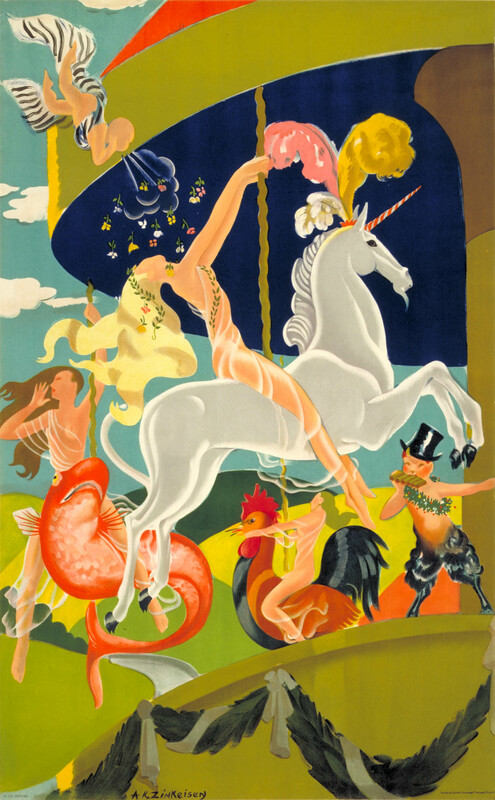 Barnett Freedman was a pioneer in the revival of colour lithography and he illustrated numerous literary works as well as designing publicity for Shell, the BBC and the General Post Office and Ealing Films. It’s almost the final week of our Poster Art 150 exhibition – so come along and marvel at Freedman’s craftsmanship before 5 January. And don’t forget to vote for your favourite! With Christmas just around the corner and the weather suitably chilly, it can be with some relief when you descend into the warmth of your local Underground station. 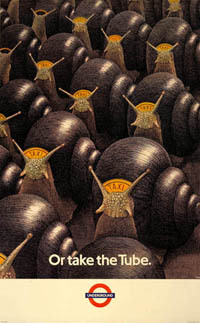 The Underground Group’s publicity department often promoted the Tube as the best way to travel, whatever the unpredictable British weather. In 1925, Kathleen Stenning was commissioned to design a set of four posters presenting the Underground as a refuge from extreme weather conditions and the most appropriate way to navigate the Capital. In this version of Stenning’s series, the Underground is portrayed as warm, vibrant and festive, encouraging people to get out and about despite the winter cold. In the same way that the red house stands out as a beacon of warmth and comfort against the snow, so does the Underground train. It is alive with activity, with one woman selling flowers and a glamorous couple alighting. While there are no people to be seen above ground– all presumably huddled up in their homes (or travelling Underground) – the train is full of people. 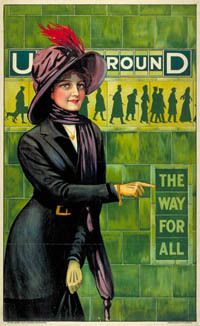 Promoting the capacity to provide refuge in inclement weather was a popular concept for the Underground Group during the 1920s. 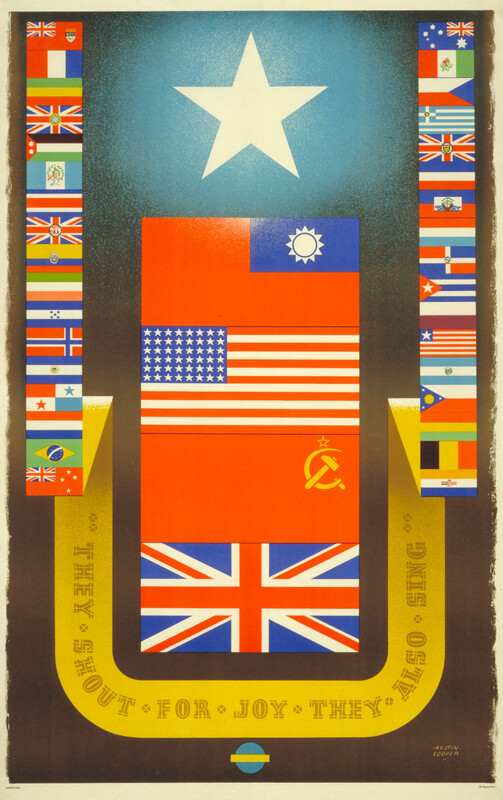 It was a theme that had been used in the Group’s publicity since its inception, with a number of posters emphasising the warmth and brightness of the system. 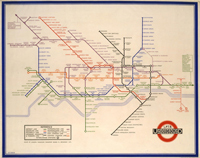 1926 and 1927 saw a duo of celebrated posters, a variation on a set by Austin Cooper in 1924, produced by Frederick Charles Herrick which similarly stressed the protective nature of the Tube. 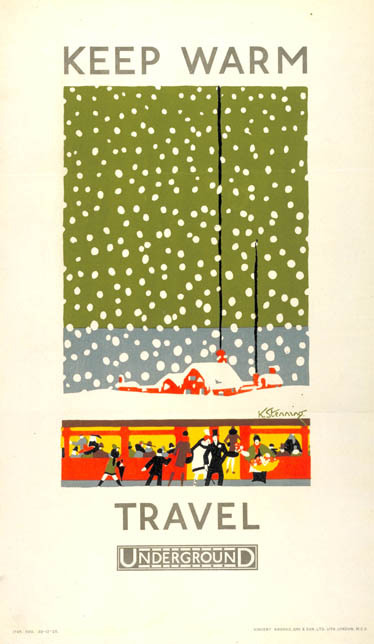 Although the image in the poster is inevitably idealised, it is still true that when the snow is falling and the roads are impassable, the Underground can act as a source of comfort to Londoners enjoying the festive period. Throughout 1913, Tony Sarg produced a series of 12 posters called ‘Humours of London’ for the Underground Electric Railways Company of London. 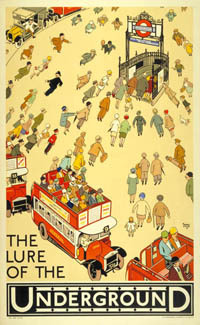 They were issued monthly and depicted humorous scenes of London’s famous places and activities. 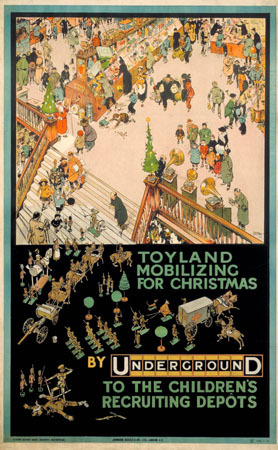 For Christmas 1913, Sarg produced a poster called ‘In Toyland’ representing a scene of gift-buying frenzy. Children clamber on the floor with toys in hand, and rotund gentlemen struggle to carry their spoils. Despite Sarg’s gentle mockery of London’s materialism, there is a festive, joyful exuberance to the poster. The 1913 poster was due to be the last in the ‘Humours’ series but 12 months later, the country was at war. 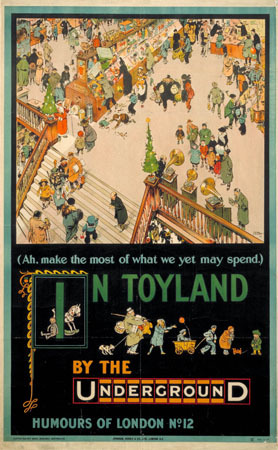 In 1914 Sarg duly produced a topical version of his ‘In Toyland’ poster of the previous Christmas. The image in the top half was identical to the original, but the text and characters in the lower half were altered. Now the text read ‘Toyland mobilizing for Christmas. 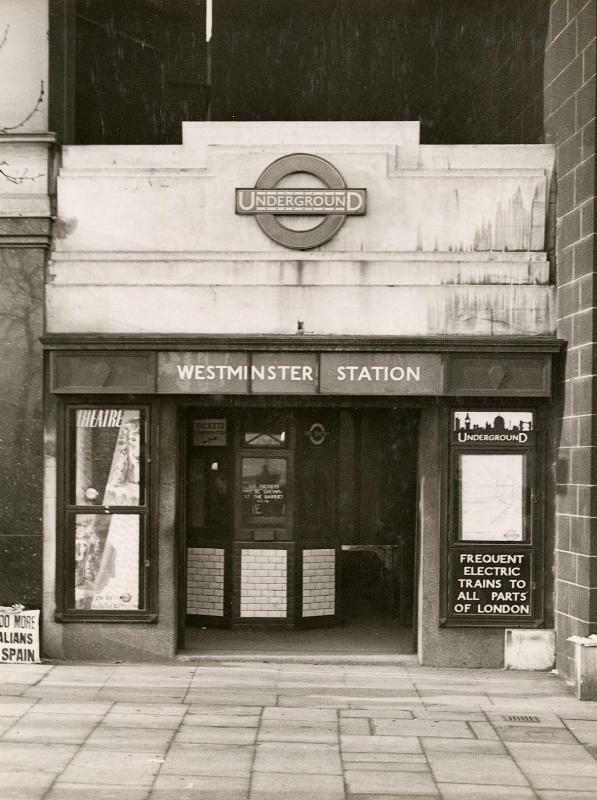 By Underground to the children’s recruiting depots’. The present-laden family group which originally occupied the space is replaced by toy soldiers in khaki, horse-drawn guns and ambulances. There is even a rather graphic depiction of an allied toy soldier standing on top of a vanquished, decapitated German combatant. 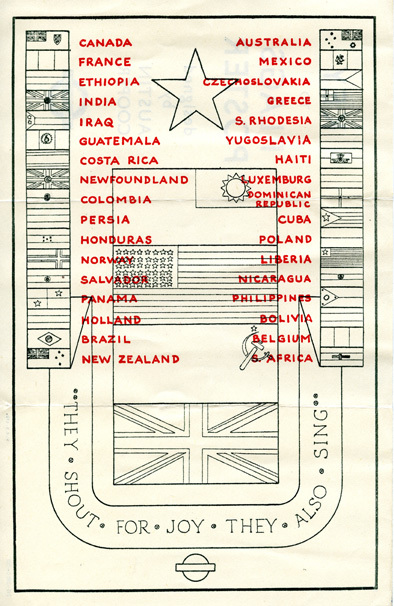 The poster was issued for Christmas 1914 and this patriotic version of the original would have been seen as a popular alternative to the usual Christmas poster. There was some initial optimism after the declaration of war that it would ‘all be over by Christmas’ but by the time December arrived it was obvious that it wouldn’t be. Interestingly, Sarg actually originated from Germany. He entered a military academy when he was 14 years old and received a commission as lieutenant at the age of 17. However, in 1905 Sarg gave up his commission to the German military and moved to the United Kingdom, before finally moving to the United States in 1915. One of the best things about winter celebrations is the abundance of lights, and so it seems fitting to focus this week on a poster that exudes ideas of warmth and illumination – not only in its design but also in it’s title. 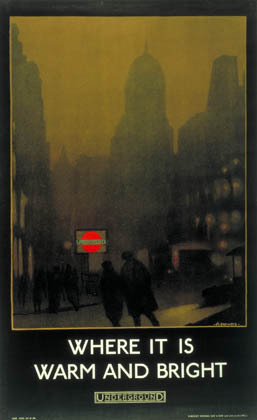 A perfect example of ‘soft sell’ advertising from the heyday of the Underground, this evocative image of the City by Verney L Danvers depicts a London street scene at night, thick with winter fog. The bright red Underground symbol – representing a familiar beacon in the gloom – invities the blurred figures into a haven of warmth and brightness. 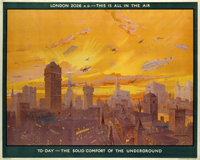 The poster shows workers heading home in the evening after a day of toil. 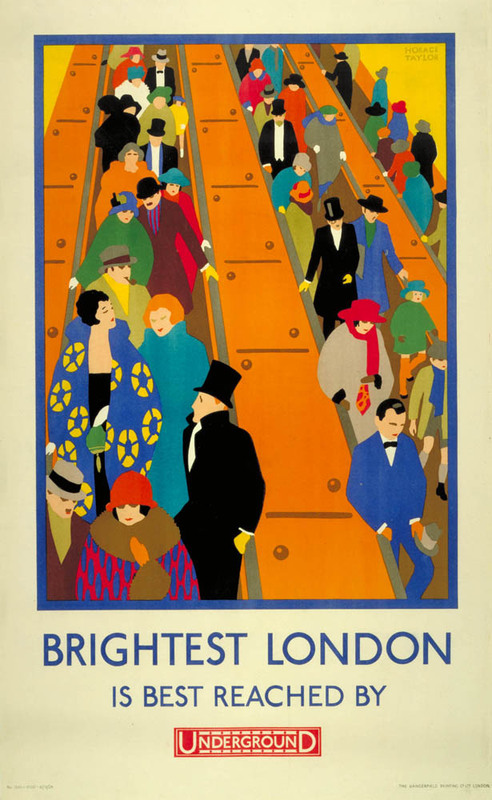 Many of these people would have been heading off into the suburbs of London which, at the time this poster was designed, were rapidly developing – very much as a result of the expansion of the Underground. 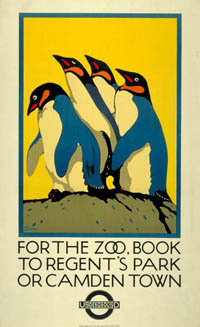 This poster is one of many examples in London Transport Museum’s archive of a lifestyle, or subliminal, approach to promoting travel on the Underground network. Perhaps though, it is more interesting in that it is also highlights the promotion of a brand identity that is now recognised as one of the most enduring symbols in the world. Graham Sutherland (1903-1980) started his career as a railway engineer but soon realised that his future lay in the arts. He studied engraving at Goldsmiths’ School of Art from between 1920–1925 and worked as a graphic artist and designer throughout that decade. 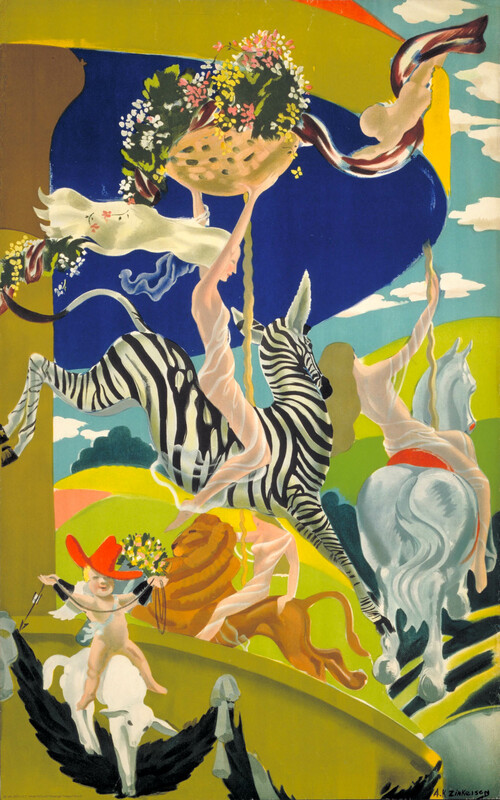 In the 1930’s he began to experiment with oil painting and took on a number of poster commissions and applied art projects to fund this new artistic direction. 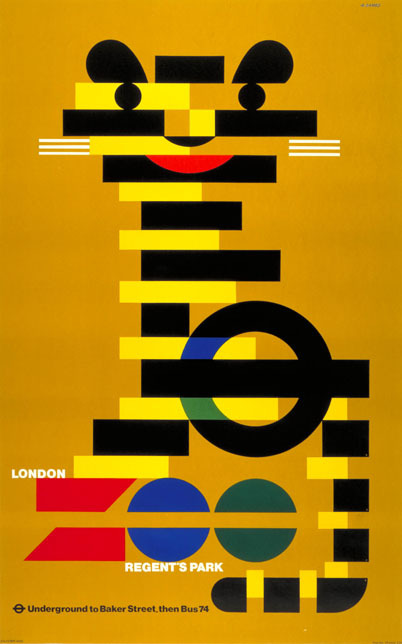 This poster, created towards the end of this period of transition, was the last of five posters designed by Sutherland for London Transport. It represents an exploration of the relationship between the real and the imagined that he went on to express in his surrealist landscapes. Sutherland contrasts the grey office with the delights of the countryside. 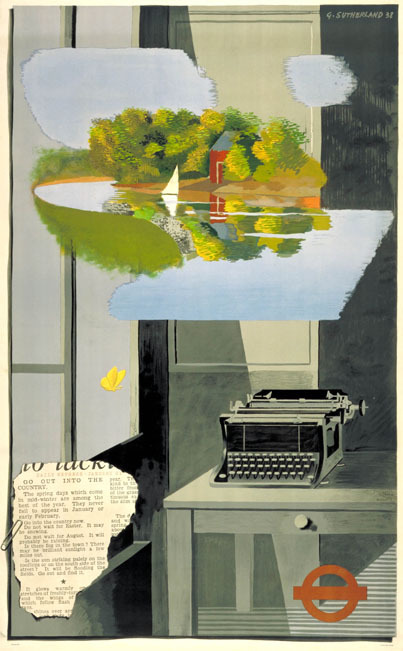 An imaginary river flows colourfully into a lifeless interior; the static typewriter evokes the story-teller’s past presence, replaced by a small bright butterfly fluttering by an open window. Created in 1938, ‘Go out into the country‘ encouraged leisure travel as an antidote to winter and the uncertain future that faced the country. A cutting from the Daily Express incorporated in the image urges the reader to take advantage of ‘pleasant winter days’ and ‘go out into the country’. Dated January 21st, the message seems optimistic rather than realistic although the image may have served as a reassuring metaphor for brighter times ahead. Poster Art 150: Top 10 posters…so far! Are you surprised by any of the posters in this Top 10? Disappointed that your favourite hasn’t made the grade? Well you can change the Top 10 by voting for your favourite, or any of the other 140 posters in the exhibition, now…before it’s too late!